Does anyone have the latest design of it? The last mock up looks just so boring and old school glasses. And does anyone know how much setback they have from western and little collins st end? What are they going to do with the apartments facing little collins st? With NAB occupying the whole tower I'd be surprised if the design hasn't been altered to suit their requirements. The beauty of this empty site has been the sun and views enjoyed by adjacent properties..... Now all to be left in the dark around McKillop and Little Collins. Sad sad sad. Good news from Decatur, on SSC. 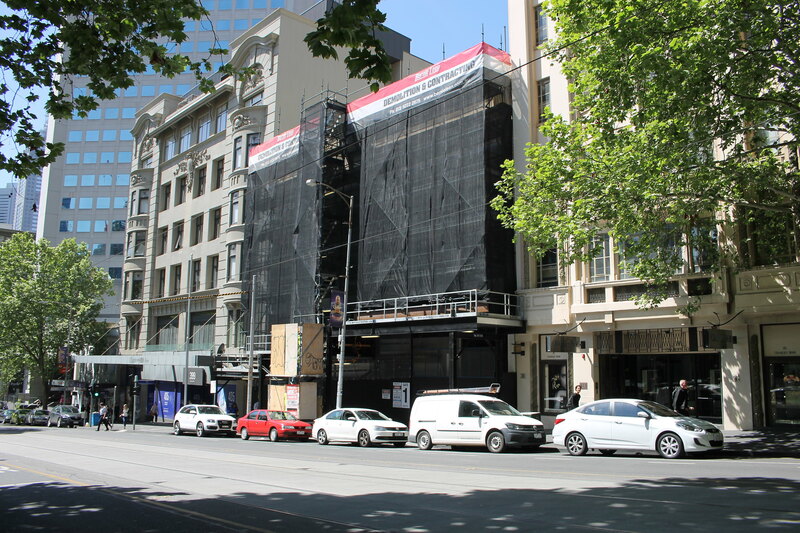 I have pleasure in advising that there is a gantry up on the main building to be demolished on the Bourke Street frontage and scaffolding is being erected. So another one on the way. I rather dislike it ! Very dramatic, but interrupts continuity of streetscape, leaving the heritage buildings with blank side walls. Yes the design is seriously underwhelming - its funny that the apartment towers in this town compete with each other for architectural expression, whereas some of the offices are a plain as can be, sticking to sheer glass. But -anyone got the full plans ? Im assuming its cantilevering over the old McEwans building, which is subdivided into apartments - isn't it ? Plus theres apartments facing little collins street, not that old, also subdivided ? Seem to be advertised for sale.....Some of the ones in the McEwans building face inwards, so presumably would have their light drastically curtailed. But the reports say that Brookfield bought it ? Dont understand. Also the McEwans building isnt heritage listed; in fact cant find much info on it even by trawling Trove - Melbourne maps says built 1918, and Sydney Smith's 1933 obituary says his firm, Sydney Smith and Ogg, designed the Danks building in Bourke Street. Brilliant news that the cheap, grey, drab 5 level piece of crap at 405 at present is being demolished and replaced. Happy days! Considering all the plans we have seen, this is a really disappointing outcome. 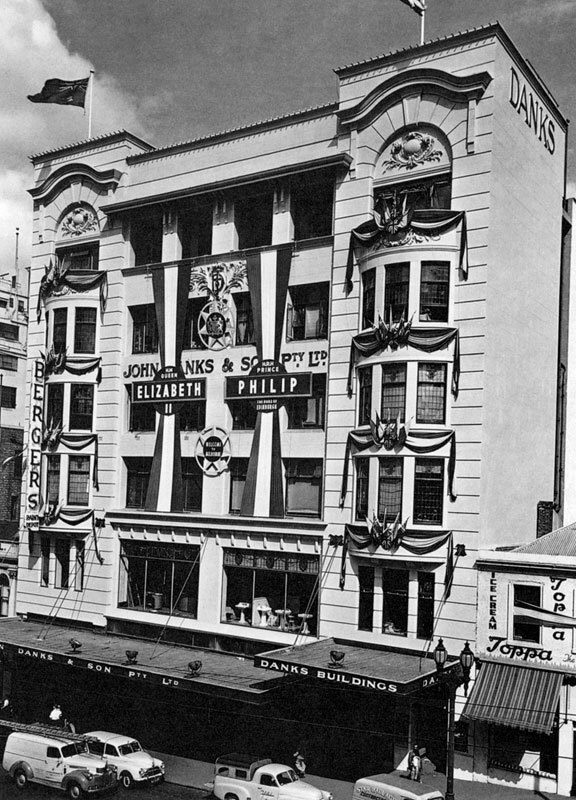 The former Bunnings, McEwan’s, Hick’s and John Danks store has an Art-Noveau facade, and is considered one of the finest palazzo style buildings remaining in the city. The building occupies a site that stretches from Bourke to Little Collins Streets, the Bourke Street front side of the building features twin oriels, balancing the façade columns on both sides similar to the Queensland building on Queen Street and the Auditorium and The Centreway Arcade buildings on Collins Street. John Danks & Son Pty. Ltd., ready for the Royal Visit in 1954. Has anyone got a plan of the back end? - I'd love to see how far this stretches over the old little Collins street apartments. anouther bland building to house yet anouther bland bank. Is that from Walking Melbourne Peter ? Not always correct, no sources given. It’s certainly not Art Nouveau, nor is it ‘one of the best palazzo style buildings remaining’ - lots more better ones, indeed lots more that are more palazzo-ish. Rohan, I gleaned the information from what I had at my disposal, including what I can see. The former owners of the building was easily seen in photographs I have of the building from different periods. It was years ago, but some of the information was probably from Walking Melbourne as well. As for art Nouveau, do you not think that the windows are in that style? Well it was definitely John Danks, we know that much ! As to style, the closest would be ‘Edwardian Freestyle’, which refers to buildings from before WW1 where style was applied ‘freely’, and the typical elements were stylised classical, shallow bow windows as here, maybe a bit of Edwardian Baroque, like the exaggerated keystones and arched mouldings above the bays either side; I can’t see any sinuous, curved decoration that defines art nouveau, the window leadlights just have those rounded almost stylised flowers more typical of the 20s. The basic form of the shallow bow window bays at each end appears a few times in Melb in this period, eg Auditorium Building, Centreway Arcade, neither of which are Art Nouveau. This form is quite different to the Palazzo too, which came a bit later, and is defined by having a solid base, a middle, and a top, like a big cornice, so I’d call it Edwardian Freestyle, though assigning styles can sometimes be tricky and not that useful. NAB has today announced it has secured a new major building located at 405 Bourke Street, Melbourne, in the heart of the CBD. 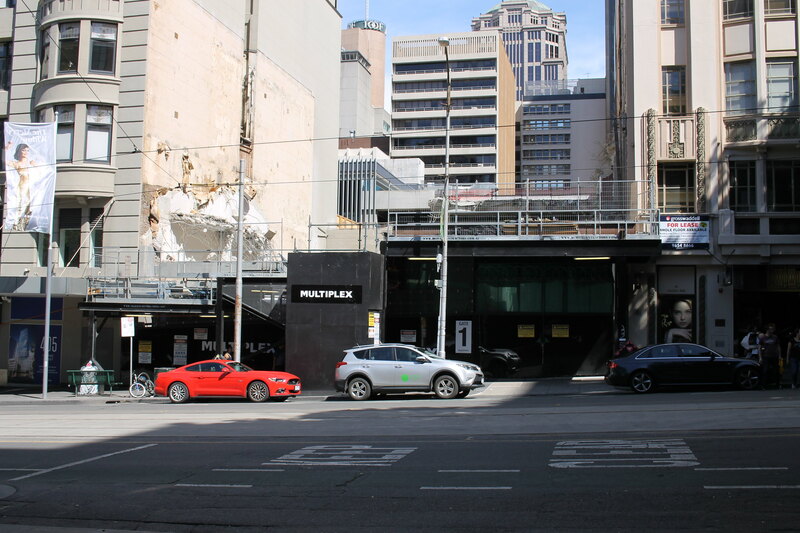 The new site sits adjacent to its existing office at 500 Bourke Street and is being developed by NAB customer, and one of Australia’s leading property developers, Brookfield Property Group. NAB Chief Technology and Operations Officer Patrick Wright said the building will be designed to deliver improved customer facing facilities and support the business’ future workforce needs. “This new office location will help continue NAB’s focus on enhancing collaboration, flexible working and efficiency across our business to deliver a greater customer experience,” Mr Wright said. The office building will complement NAB’s existing presence at premier sites, 700 and 800 Bourke Street, and will also consolidate Melbourne offices at 500 Bourke Street, 8 Exhibition Street and 101 Collins Street, Melbourne. 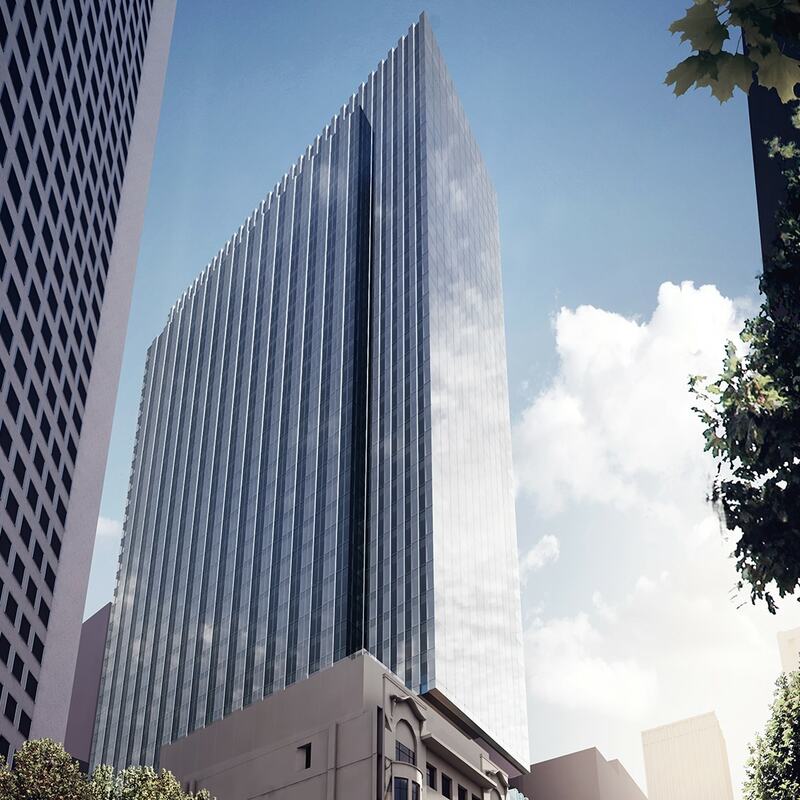 NAB will be the anchor tenant at 405 Bourke Street, signing for a minimum of 43,000sqm of space, with options to take the remainder of the space to provide future flexibility. 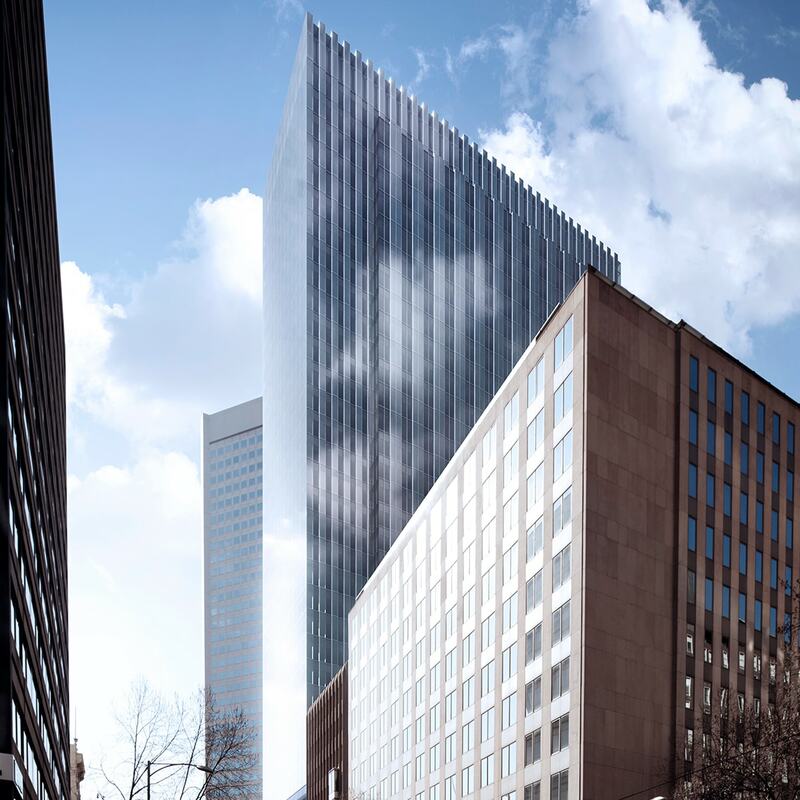 This lease agreement follows the announcement that NAB’s Sydney employees will move into offices at Wynyard Place which is also being completed by Brookfield, and Parramatta Square in 2020. Construction of the new Melbourne site has commenced and employees are expected to move into the new NAB premises in 2021. Even the Sydney tower looks as boring as this. Woods Bagot is just boring, I guess. Damn, was really hoping there would be a redesign. Will look fine I guess but meh. 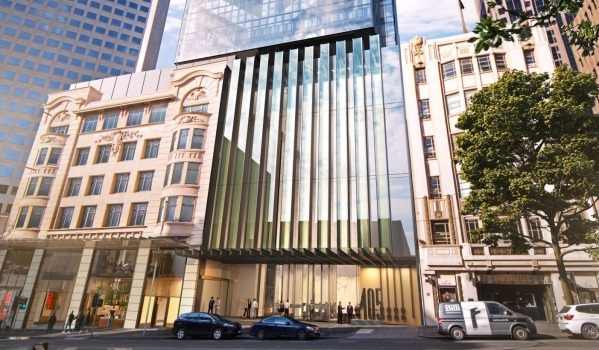 ISPT has acquired 50% of the proposed development at 405 Bourke Street, Melbourne from Brookfield who retains a 50% interest. 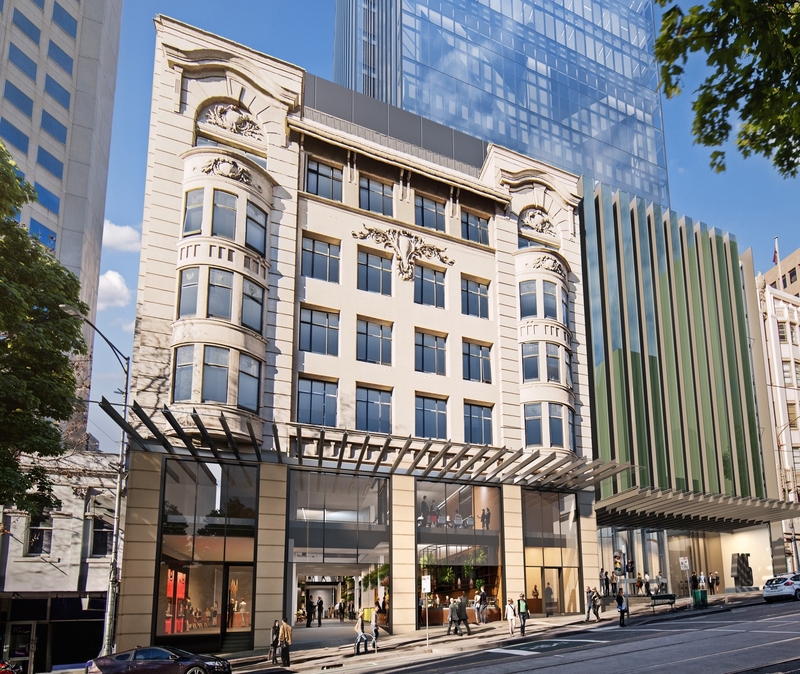 NAB has signed on to be the anchor tenant of this new, high profile commercial address in the heart of the CBD. 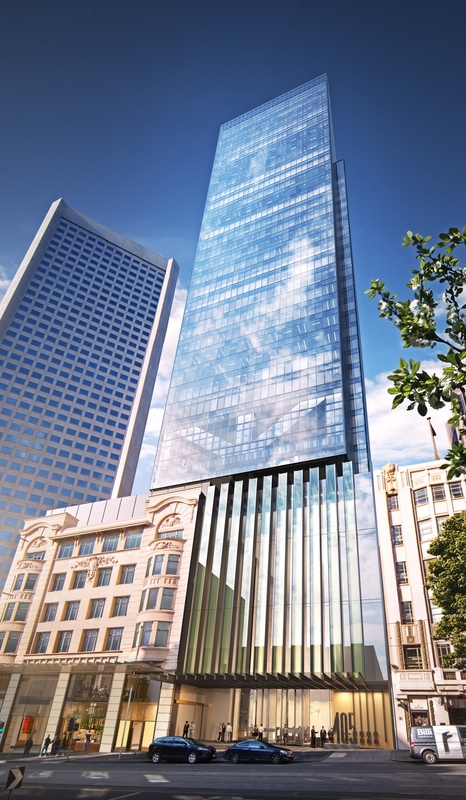 405 Bourke Street will include a 39 level building with 31 office floors of Grade A office accommodation with Premium services and three levels of retail. The property is targeting 5 Star Green Star and 5 Star NABERs Energy and 4 Star NABERs Water ratings. Construction is expected to commence in April 2018 with completion scheduled for March 2021.